The spacious 5.9 cu. 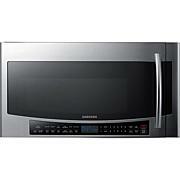 ft. oven splits into two ovens with the Smart Divider to cook at two different temperatures at the same time. Unique middle-hinged door can open just the top section or the full door, for total flexibility and energy efficiency. Cook a big roast, multiple casserole dishes or several racks of cookies at once. Three oven racks let you prepare enough food for large gatherings. The five burner cooktop lets your cook with different sized pans simultaneously. The triple burner has three different-sized heating elements in one. 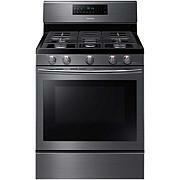 The Samsung NE59J7850WS Flex Duo 30" Glass Cooktop Range with 5.9 Cu. 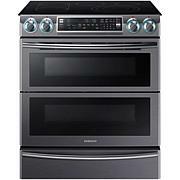 Ft. Dual Door Electric Oven splits into two ovens with the Smart Divider to cook at two different temperatures at the same time - with no noticeable transfer of aroma. The unique middle-hinged door can open just the top section or the full door, for total flexibility and energy efficiency. 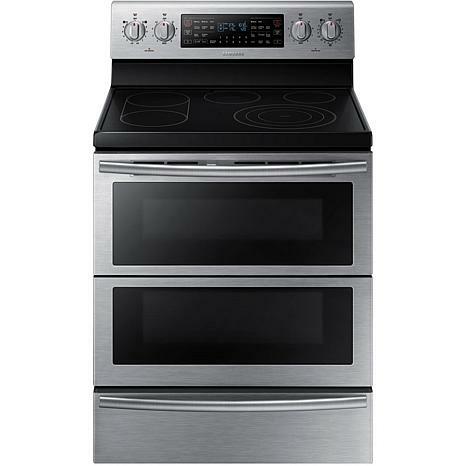 The large capacity lets you cook a big roast, multiple casserole dishes or several racks of cookies at once. 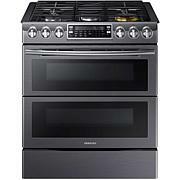 Three oven racks let you prepare enough food for large gatherings and the split rack on top lets you cook taller dishes. The five burner cooktop lets your cook with different sized pans simultaneously, including the triple burner has three different-sized heating elements in one. Three oven racks let you prepare enough food for large gatherings so you can cook a big roast, multiple casserole dishes or several racks of cookies at once. Center (rear): Warming Center, 7"